So this recipe is kind of a lie! It takes longer than a few minutes to cook but the prep can literally take you under one minute then all you have to do is leave it in the oven (or microwave) to bake! Simple! This also makes for a great dessert or nighttime snack when you’re in need of something sweet! Use an apple corer to core your apple. Stuff the core with almond butter and raisins alternating between the two. 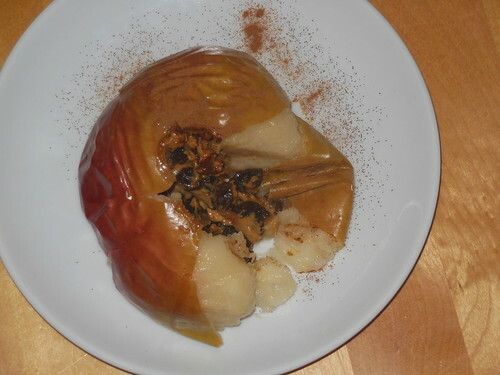 Bake your apple in an oven safe dish for 30 minutes. Let cool, sprinkle with cinnamon and enjoy! Note: You can bake this in the microwave too if you like! Core your apple and bake in the microwave for around 8 minutes on high. Then stuff the middle with the fillings. What’s your go to sweet treat when you want something at night??? Any favorite nighttime snacks? This entry was posted in Recipes on November 2, 2012 by danielle. A baked apple sounds sooo good right now! You can have one tomorrow Yay! Mmmmmm….I could totally go for some apple goodness right about now. I always crave apples in the fall! That sounds amazing!!! I’m going to have to try out that combo! Mmm I love baked apples! My favourite sweet night time snack is Greek yogurt and granola because all that protein keeps me nice and full through the night. I love having Greek yogurt for my nighttime snack! baked apples are perfect for the fall! Me too! I need to start making them more often! I was actually JUST thinking about making baked apples. Weird. Given the ridiculous obsession I have with apples right now, this is looking soooooo good. LAtely I’ve been enjoying a waffle with AB and jam for my nightly snack, but I may have to give baked apples a try. I always have an apple obsession! I just love them! My favorite nighttime snack is usually cereal with almond milk and pb2 or peanut butter. This apple recipe looks awesome though. I just got this new peanut butter that’s ‘cinnamon raisin granola’ peanut butter, so all I would have to do is stuff that in there! I’ll have to try it and let ya know how it turns out. This would be amazing with that peanut butter in there! Definitely try it! What a good idea, I saw Lindsey of Lean Green Bean do something similar to this on IG the other night. The way the skin of the apple rippled up like that makes this look totally gourmet. Hahaha I am far from gourmet but they are really good!! This looks like a potato for some reason ha ha. I’m actually a freak, who doesn’t like cooked apples, but I think it’s because they are still slightly crunchy or something…this one doesn’t seem to be…maybe I’d actually like this! Hahaha I’m with you actually! I must prefer a regular apple too! This one wasn’t crunchy at all yet! Yum!! Baked apples are so delicious… I can’t remember the last time I made one. Great idea for a healthy dessert! Awesome idea, great for a quick treat! Yes it’s perfect for when you want something sweet! mmm I’m making this tonight! I’m giving up pumpkin now that I’m orange! This is going to take its place! hahaha oh no! Well this is perfect then! I’m totally making this tonight. I don’t have raisins but i’ll use cranberries. That would be great too! Hope you like it! 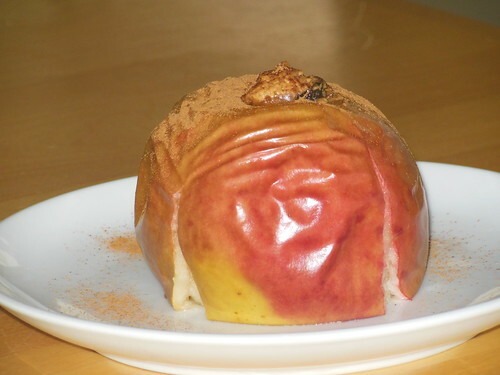 I love warm apples with cinnamon, but I never think to make them. Not Paleo, but I’m thinking up a cinnamon apple oatmeal. Have a great weekend! That would be good! I actually love oatmeal! Have a great weekend too! Hi hello healthy dessert. I’m a fan. I’m a HUGE baked apple fan. Have always been since I was a kid 😀 Thanks for sharing girlie! Of course! Glad you liked the recipe! This is a fab idea! I’ve softened apples in a microwave before for oatmeal. do you think you could do that with this recipe? Then it would literally be minutes! Totally and I bet it would be awesome! 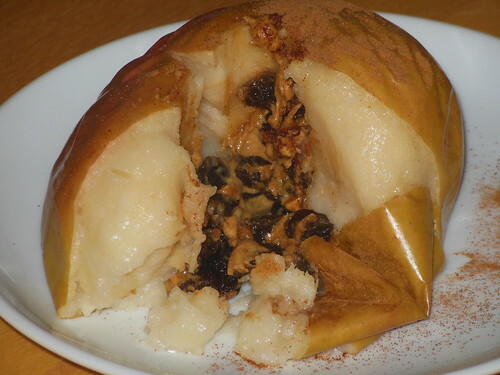 I have been eating cubed baked apples like crazy lately…totally craving them. This recipe is such an easy idea! Can’t wait to try this. Do you have a favorite variety of apple for baking like this? Hmm I used macintosh but I love any apple really! wow this looks delicious (and simple), think i’m going to try it tomorrow! I also have to try an apple crisp recipe –> that girl is obsessed with apples too! Have you already tried Paleo lasagna? (you put zucchini or eggplant instead of the pasta).I did it tonight for the 2nd time and ooooh it was delicious! Even if i’m totally not eating Paleo, i like to try some Paleo recipes! Thanks so much! Yes I love making paleo lasagna with zucchini! So yummy!